Did you know that 39% of organisations say that digital transformations have helped them generate real-time sales online? A further 32% say that a digital transformation has improved operational efficiency, and 28% say it has helped them acquire new customers. Since the start of 2014, I have been going through a digital transformation. Whilst I still use the same forms of online and offline marketing including networking, events, email marketing, PPC, and social media, I have understood more from my audience what works for them, and have changed the way I connect with them. I have also understood the importance of podcasting, video and live streaming have made this a huge part in the way I run remarketing campaigns on native platforms. When I launched my online training business, I realised that I was not getting the traffic I wanted, nor expected. Because of this drop in traffic, I decided to work with a number of influencers and turned my website into an invaluable asset. A website is always a working process, but with just a few tweaks around my CRO (conversation rate optimisation) that has help my digital transformation and user journey, and the way I position myself online, I have found that my website has vastly improved in all aspects. Going through a digital transformation is something that is being implemented by both small businesses, and larger corporation. By the end of 2017, 75% of CEO’s of global 2000 companies will have a digital transformation as the centre focus of their corporate strategy. A Digital transformation is what a business will go through when looking at improving, and achieving success through their sales and marketing activities. Going through this transformation means that you, as a business, understand the opportunities between the team, and the technology available to accelerate the impact your brand can have across multiple touchpoints and then building a strategy to approach this. 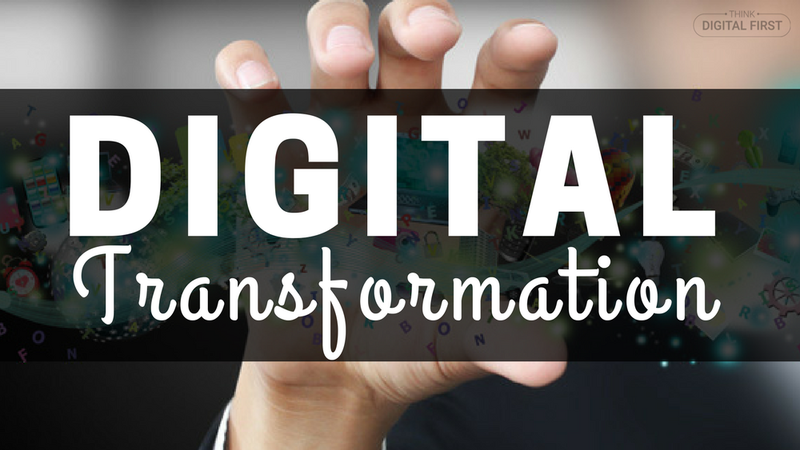 Why Should You Go Through A Digital Transformation? Going through a digital transformation means that you are meeting your business growth challenges head-on, and understanding your customers needs, technology available and all of the moving parts a successful business should be aware of. In doing this, you will better understand the opportunities available to you as a business online, and also give your brand the best chance to succeed. The difficulty with going through a digital transformation is looking at what needs to be achieved in both sales, and marketing. Historically, sales and marketing have battled against each other. On one hand, sales is economic, and on the other hand, marketing is cultural. So, let’s take a look at the impact going through a digital transformation will have on sales, and then on marketing. Going through a digital transformation will give you a competitive advantage when it comes to generating sales for your business. Having that shift in your business means that you are giving yourself, and your employees the chance to access better data, and better ways to process this data because the technology you are using are more advanced, and up-to-date. With having better data, comes better selling techniques and democratises the access to information, and decision making, meaning from a sales point of view, you can be more productive. To give you an example, one of my most recent Warren Knight blogs was all about AI (Artificial Intelligence) and machine learning, and how this is being applied to businesses to become more sales efficient. Having access to AI will provide you with ways in which you can effectively sell your products/services. The online world demands real-time, on-demand and attention grabbing content. Sales is one thing, but marketing both pre, and post sale is even more important because of the way consumers want to connect with businesses online. Going through a digital transformation will heavily impact your marketing strategy in a positive way. Imagine if you could generate a better ROI and ROE on your marketing by actually speaking with your customers, and not just speaking at them. Offering great customer service as a part of your marketing is something that can only be done with real effect if you are engaging, developing loyalty, and most importantly; understanding what the customer needs, and going through a digital transformation will help you achieve this. Marketing used to be like throwing a dart at a dartboard, and hoping to hit bulls-eye. We no longer have to guess, and hope that something will work. We have the technology to KNOW what will work, and how to achieve the best possible outcome. We can now do things in marketing because we can analyse the data in real-time and engage in real-time. Looking to the future, for your digital transformation to be as successful as possible you need to forget about a battle between sales and marketing and both combine, and integrate all of your marketing with your sales processes. I have found that, by understanding the type of marketing that works for my audience, I can then reach my sales goals, and understand how to build the customer retention, and brand advocacy post-sale. Are you going to go through a digital transformation and if so, what is the first thing you are going to do?